Family Dentistry Malta - Do You Need A Root Canal From Your Dentist? Do You Need A Root Canal From Your Dentist? If you need a root canal, but you’re anxious about visiting your Malta family dentist, we understand. The dentist office for anyone can be nerve-wracking. However, we would like to share with you that we do our best to make our patients comfortable and relaxed while receiving treatment. We pride ourselves on completing dental procedures from examinations to major procedures in the least amount of time possible, keeping the patient calm and comforted. In this post, we will share the benefits of root canal therapy and a common myth. If you’re ready to schedule your appointment, give Salvatore Dental a call today! Otherwise, continue reading to learn more about root canals. Teeth are strong and durable. However, they can wear down and break, exposing the nerves at the root. If the exposure of nerves is not handled promptly, bacteria could invade the area and infect the tissue. This results in a more oral health issues. The simple solution is to visit your local family dentist in Malta for a root canal. Here are some of the benefits. When you have an infected tooth and/or gum, it can be painful. The swelling and potential smells due to the infection can be disheartening. Root canal therapy is virtually painless, and it remedies the recurring pain you scheduled the appointment for. Many of our patients report that our gentle dental care and attention to detail is what made the therapy effective for them. Compared to a tooth extraction, root canal therapy can save a tooth root without having to remove it. Furthermore, a tooth extraction is considered an invasive surgery while root canal therapy is not. A successful root canal can remove infection and allow for tooth preparation for repair or a crown, whichever is best for your oral health moving forward. It’s never good to have an infection in your mouth. It can grow and spread from its genesis and cause more expensive oral health issues that can cost way more than root canal therapy or even a tooth extraction. The best approach to safeguard your oral health is to contact your family dentist in Malta if you’re experiencing any kind of tooth pain or discomfort. If you’ve cracked or broken a tooth, we strongly suggest you contact your dentist immediately. You may have been told that root canal therapy is excruciatingly painful. You’ve probably heard nightmare stories about patients never going back to the dentist again after a root canal treatment. Fortunately, the myth that root canals do not work is false. 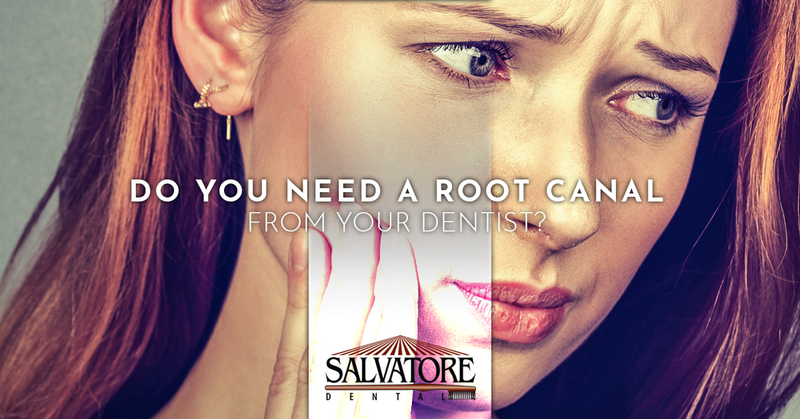 At Salvatore Dental, we see root canal therapy work for many of our patients. It’s a great way to start the process of restoring a tooth to its former health. Schedule an appointment at Salvatore Dental today! We understand if you’re feeling anxious or nervous about visiting the dentist. You may or may not need a root canal, but you won’t know until you come see us. A cracked, chipped, or broken tooth is a sign that you do need dental work completed; however, your family dentist in Malta will be sure to get you the best treatment for your oral health. Call to schedule an appointment today!